Psychic Wayne Isaacs: Medium or Mediocre? The following article was written by Brian Byrne and was originally published on The Daily Shift on September 21, 2012. The article and its comments are the opinion of Brian Byrne and may or may not represent the opinions of BadPsychics. Also make sure to check out the links at the bottom of the article that lead to further exposures of Wayne Isaacs and Psychic Readings Live. 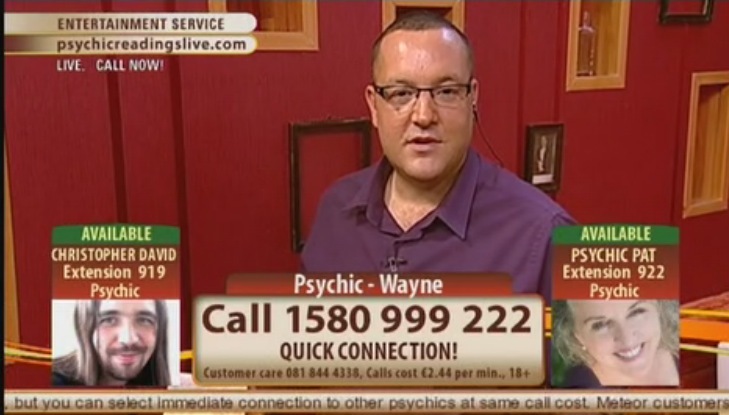 Can Psychic Wayne live up to his name? The Daily Shift’s Brian Byrne gets a reading from Psychic Readings Live host Wayne Isaacs and finds out for himself. Psychic Wayne of Psychic Readings Live performed a reading for me today. I’m still convinced he was reading the wrong page. Wayne describes his ability as a muscle; “The more you use it, the stronger it gets”. He says it’s a connection with his guides: his mother, who died in 2003, and his twin brother, who died at birth. While he can’t see them, he claims he can sense or feel them. His guides, he says, help him give messages to other people. During my reading, Wayne was wrong more often than he was right. If you were to ask Wayne, he might tell you he was having an off day. “We’re not God. We don’t get it right all the time”, he told me before the reading began. But my results make his abilities seem like little more than guesswork—and not very good guesswork at that. The cold reading technique is infamous among skeptics. So called psychics make probing statements in an attempt to reveal information about their subject. Every time Wayne stated something about me or the people in my life, he asked me to confirm or disconfirm it. This is also part of the technique. If the subject dismisses the statement, either verbally or via facial or bodily cues the psychic quickly moves on; if not, the psychic knows they’re onto something and narrows their scope. I did my best not to give Wayne any hint as to whether he was on the right track. I tried to keep a straight face; to neither nod nor shake my head. This seemed to make him uncomfortable; on two occasions he asked me to relax, that I was nervous, that the more open I was, the better the reading would be. Did it work? Wayne’s attempts at the technique, with me at least, weren’t very successful. First, he said my mother had a miscarriage. She never did. Later he told me my sister had blonde hair. Wrong. Then he changed tactics and told me my brother did. Again he was wrong. So he said it was my mother, maybe. Still wrong. “There’s a lady in your life that there’s been problems with. It’s a love situation. I’m being shown the breaking of the heart.” Again, wrong. First of all, I’m gay. I’ve never had a girlfriend. Here, Wayne was employing cold reading again. He was probing, using a sweeping statement that could apply to many people. Think about it – how many men have had their heart broken by a woman? But his reading wasn’t a complete failure. Wayne successfully named a person who died in my family (albeit my extended family), and he also named one of my good friends, even if he did have to ask whether she is my girlfriend. That means either one of two things: Psychic Wayne is a fraud or I’m so good at hiding my sexuality even a psychic can’t out me. Wayne also pointed to an issue I have with finance. Maybe it was the admittedly grubby outfit I wore during our meeting; maybe it was my age. Either way, do you really need to be a psychic to tell a lot of people are struggling with money right now? Come on. Before the reading, Wayne pointed out that there was no accurate way to test a psychic’s ability. 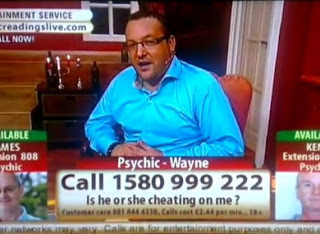 While he was unable to give me an accurate reading, that right there is something he was right about: until we find a way to police psychics and their supposed abilities, people like Wayne Isaacs will carry on giving out inaccurate readings and, in the case of Psychic Readings Live, continue making money from them.